History is my favorite part of Assassin’s Creed. Years ago I used to read through all the historical database entries, getting context about historical figures and landmarks in Florence, Rome, colonial Boston, and more. And I spent hours in Assassin’s Creed: Origins’s Discovery Tour earlier this year, admiring how much detail Ubisoft put into recreating Ptolemaic Egypt from both primary and secondary sources. This year’s Assassin’s Creed: Odyssey ($60 on Humble) is also set to receive a Discovery Tour mode at some point in the future, and I’m looking forward to it. Ancient Greece is a favorite era of mine. But it turns out there’s quite a bit of history already in Odyssey—but you have to know where to look. 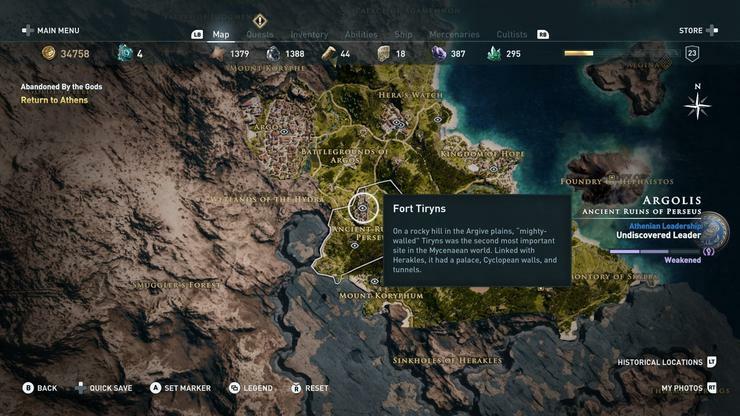 As I played Odyssey, I noticed I kept unlocking what it termed “Historical Locations.” Some were pretty obvious, like the Agora in Athens. That’s an area of great historical importance, sure. But others were much stranger. 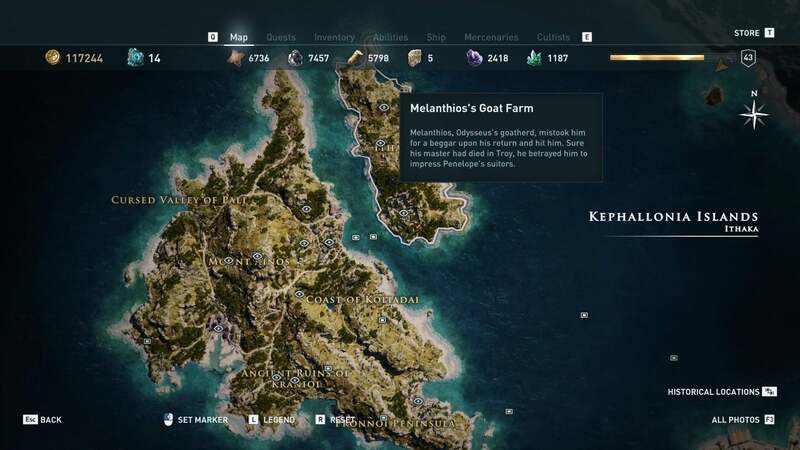 On the early island of Ithaka for instance, you’ll unlock a...goat farm. Or the Bull of...Oreos? Sounds delicious. And that’s why I’m writing this article, because it took me something like 25 or 30 hours to figure out that yes, there is lore attached to those historical locations. It’s just hidden in such an impractical place you might never notice it—and that’s a shame, because it adds a lot to what’s otherwise mere set dressing. I’m focusing on Kephallonia because it’s early in the game, but it doesn’t matter. You’ll see it’s covered in icons—forts to conquer, sync points, caves to explore, and so on. These are what Odyssey terms “Gameplay Icons,” and you’ll notice in the bottom right corner there’s a button prompt to hide them, yeah? Oh, this is interesting. 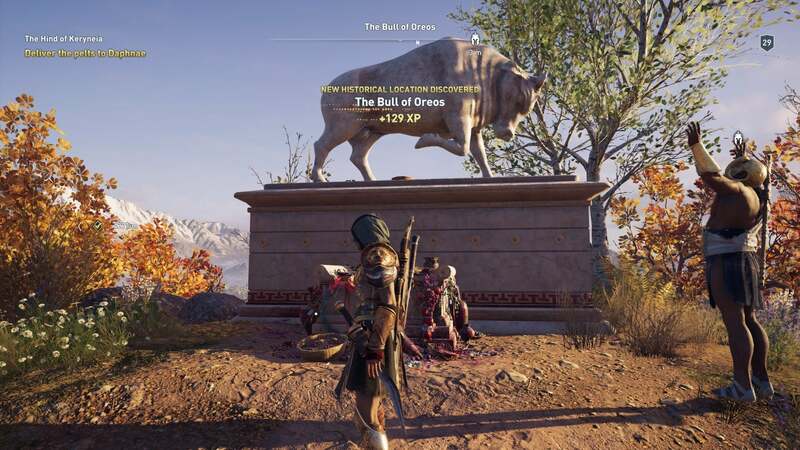 Yes, this is where Ubisoft’s hidden all the history blurbs about Ancient Greece. Every single “Eye” icon on the map indicates another blurb. They don’t show up on the map normally, nor is there any indication that this feature even exists. But it does, and it’s great! Remember that goat farm on Ithaka? Turns out it’s much more than a goat farm. Mouse over it and you’ll see the following: “Melanthios, Odysseus’s goatherd, mistook him for a beggar upon his return and hit him. Sure his master had died in Troy, he betrayed him to impress Penelope’s suitors.” Courtesy of Homer’s Odyssey, now an unremarkable setpiece has some flavor. Thus, centaur statues—a marriage of myth and history that Assassin’s Creed: Odyssey likes to explore but doesn’t explicitly call out in-game. The enormous Zeus statue on Kephallonia is another such example. 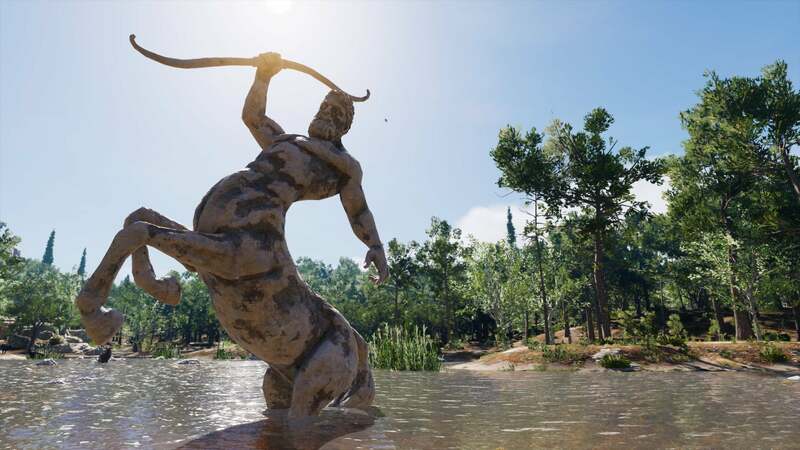 It’s not a recreation of an actual statue (to my knowledge) but as the accompanying Historical Location entry explains, “The Lightning Zeus is depicted as such to mirror the geophysical phenomena of Mount Ainos, known for its spectacular thunderstorms.” Like the centaurs, it’s a cool visual and one Ubisoft’s used a lot in marketing. It takes on a deeper meaning though when you realize why that mountain, why Zeus, why this larger-than-life depiction. And for some reason Ubisoft hides that meaning multiple menus deep. I don’t know why the developers made that decision, although the map is certainly cluttered enough without these Historical Locations. Maybe that’s the problem. It’s too bad you could play through the whole of Assassin’s Creed: Odyssey ($60 on Humble) without stumbling on this other layer though. There’s a lot of interesting historical information contained within, and a lot of great pseudo-historical information as well—insight into the Ancient Greece of Odyssey that explains how and why it differs from the strictly historical Ancient Greece we might know. Hopefully Odyssey’s Discovery Tour will have even more to say on these subjects, but for now it’s well worth checking out this semi-secret map layer. You never know what you might learn.